The lumbrical muscles look like the earthworm in shape, size, and color. Lumbrical is originated from the Greek lumbricus, which means “earthworm”. The lumbrical muscles are four worm-like muscles in the foot level that pass dorsally to insert into the free medial margins of the extensor hoods of the four lateral toes and originate from the tendons of the flexor digitorum longus. The first lumbrical originates from the medial side of the tendon of the flexor digitorum longus that is associated with the second toe.The staying three muscles emerge from the sides of surrounding tendons and are bipennate. They connect the flexors of the toes with the extensors and they have a long muscle belly compared with their tendon. Contraction of the lumbricals produces flexion of the toes at the metatarsophalangeal joint, by their connection to the proximal phalanx. Because they also enter into the extensor hood, the lumbricals extend the interphalangeal joints. Indeed, this latter action is primarily due to the lumbricals and not the long and short extensor tendons. First common palmar digital artery. Second and third common palmar digital arteries. Third and fourth dorsal digital arteries and. Their anastomoses with the palmar digital arteries (3, 4). While the other three are innervated by the lateral plantar nerve, the first lumbrical is innervated by the medial plantar nerve. Clawing of the toes in the forward phase of gait is prevented by the action of the lumbricals. The extensor muscles pulling the toes into hyperextension at the metatarsophalangeal joints is result of paralysis in these muscles. Even at rest the toes end up being clawed when they are paralysed. For such a small muscle, the nerves which supply these muscles seem to have many more fibres than would be necessary and a multitude of these are sensory. They may have a very important function in the supplying back information related to the stress developed between the long flexor and extensor muscles. It is not possible to palpate these muscles as they lie deep in the sole of the foot covered by a number of the small muscles of the sole and the long flexor tendons. They are small slim muscles one for each digit. From lateral to medial side there are four lumbrical muscles and numbered first, second, third, and fourth. They are named lumbricals due to their elongated worm-like shape (L. lumbrical = earthworm). Lumbricals 1 and 2: Flexor digitorum profundus – From lateral side of lateral two tendons. Lumbricals 3 and 4: Flexor digitorum profundus – From adjacent sides of medial three tendons. To be inserted into the lateral side of dorsal digital expansion of the corresponding digit from second to fifth, these tendons go across the radial side of metacarpophalangeal joints. To the deep transverse metacarpal ligaments, the tendons of these muscles are located anteriorly. The lumbricals insert into the extensor hood and pass dorsally around the lateral side of each finger. 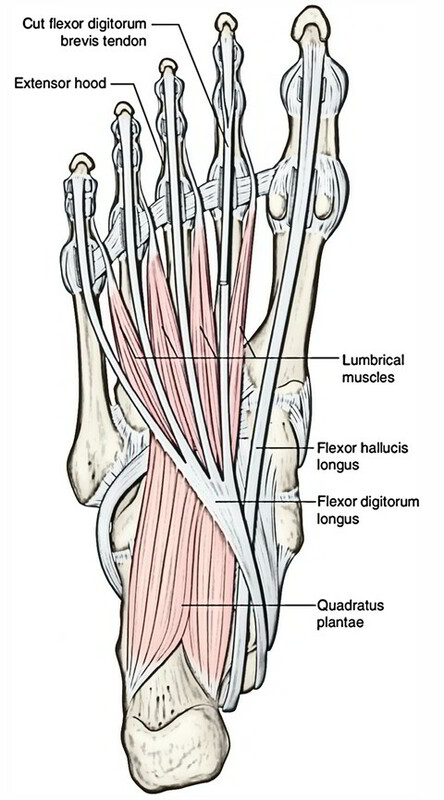 The lumbricals show their uniqueness in their functionality as they link flexor tendons with extensor tendons. They take part in contracting the metacarpophalangeal joints and extending the interphalangeal joints. Through their insertion into the extensor hoods. First and second lumbricals – the median nerve (C8, Tl). 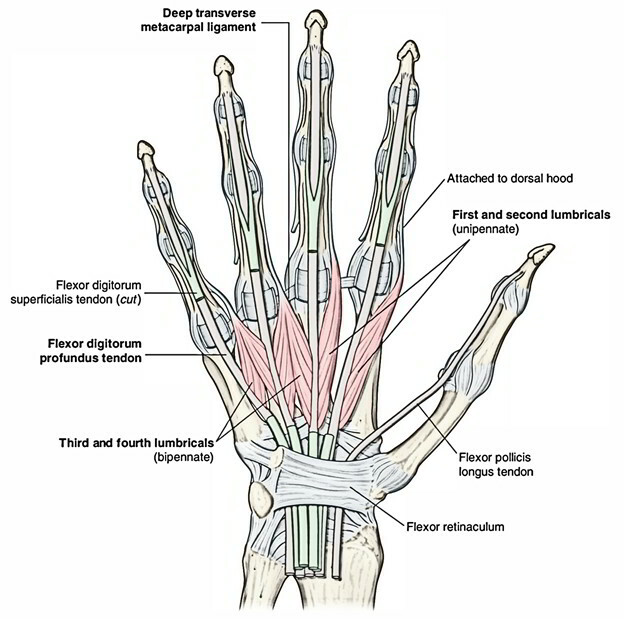 Third and fourth lumbricals – the deep branch of the ulnar nerve (0, 8, Tl). Lumbricals flex the metacarpophalangeal (MP) joints. Extend the proximal and distal interphalangeal (PIP and DIP) joints.